“This is a humanitarian crisis,” so says Jeanne-Aimee De Marrais of “Save the Children.” She is talking about the thousands of children flooding the U.S. border with Mexico. 60,000 to 80,000 minors, in need of housing, care, medical treatment and transportation, are expected to cross the border this year. In May alone, the Border Patrol apprehended an unprecedented 9,000 minors. Poor economic conditions and intense violence in Central American countries are cited as the primary reasons for the inflow. In hopes of safe passage, many children are given to smugglers by their families — only to be beaten, starved and abused before they even get to the border. The promised ‘permisos’, or permits into the U.S., do not exist. 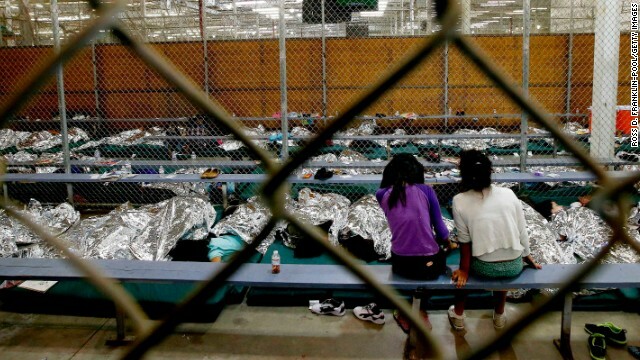 Country of origin impacts the treatment of children once they get to America. Currently, children from Mexico can be turned back if they have no fear of persecution, no signs of trafficking and are old enough to make independent decisions. Others from non-contiguous nations like Guatemala or Honduras are processed by the Border Patrol and then turned over to the Office of Refugee Resettlement (ORR), part of the Department of Health and Human Services (HHS) within 72 hours. After that, ORR seeks to place children with a parent, relative or sponsors. Though according to HHS, this process can take anywhere from 30 to 45 days. Temporary facilities, like the Lackland Air Force Base in San Antonio, Texas, can only hold 1,000 children at a time. Border patrol agents are being drawn away from their primary task — protect the border — by care-giving efforts. What happens in the meantime? More “child-friendly spaces,” like the one that Save the Children set up in McAllen, TX, are a viable short-term humanitarian option. These spaces are designed to act as a safe area, separate from Border Patrol facilities, for both women and their children. Although many child arrive alone, some come with mothers or older caregivers. Women and children are given bus tickets and temporarily released by Border Patrol after they’ve gone through the initial intake process at the border. Then, kids can have access to organized activities, quiet play areas and supportive adults. Mothers can take a hot shower, see a doctor, eat a hot meal and have a much-needed moment of rest while their children are taken care of. Although short-term, child-friendly spaces are only a start to the humanitarian response necessary at the border. The current space run by Save the Children in McAllen, TX has physical constraints and can only serve 15 children at a time. Anywhere between 150 and 300 women and children come through their doors every day. Non-profit organizations, faith-based agencies and the federal government are all looking for lasting solutions to the support the needs of children attempting to cross the border and before they become just fodder for the political ruckus over immigration. “This is going to be a long-term crisis that we’re all going to need to be a part of. At the end of the day, we must remember that they are children,” said Marrais.